Going up Highway 395, the Eastern Sierra Scenic Byway, has become routine during the last couple of years... When Highway 14 finally ends at the 395, arid desert is replaced by the wondrous Owens Valley, home to the Alabama Hills and much more. Lone Pine is my base here, and I find myself traveling toward Death Valley National Park just as often as driving up toward Mono Lake or the Ancient Bristlecone Pine Forest in the White Mountains. The following photos were taken during during a 3-day road trip through the Eastern Sierras in September, 2010, during a March 2012 weekend in Death Valley National Park, during a 27-hour road trip through the Eastern Sierras (also in March 2012), a weekend drive up to Mono Lake in March 2013, and a 30-hour road trip to the Ancient Bristlecone Pine Forest in May 2013. 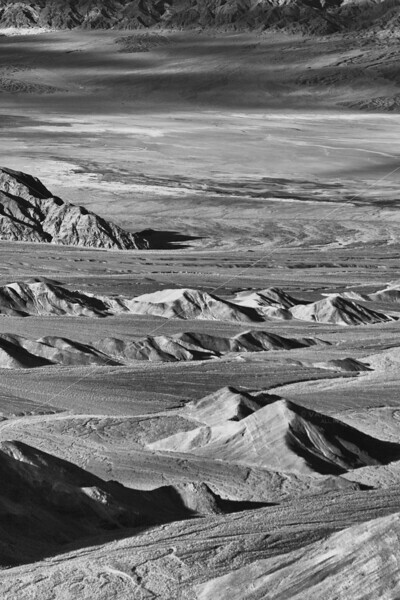 A "Lunar" landscape from Aguereberry Point, Death Valley National Park. Photographed March 30, 2012.